The Maticevski MBFWA 2015 show was spellbinding and other-worldly charming. It transfixed anyone lucky enough to discover it – incalculable but measured only in admiration…. 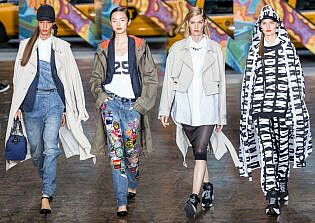 Love was in the air at the Jayson Brunsdon runway show today at Mercedes Benz Fashion Week. Great women have inspired past collections…. Emporio Armani gave us a serious case of the blues with their S/S 15 collection – and we love them for it! The sea of blue was kept fresh and interesting with the combination of carefully selected fabrics and contrasting textures – crisp cottons sit alongside PVC, mesh and silk touches. Peter Pilotto’s S/S15 presentation at LFW was a feast for the eyes. Whether you like their style or not, you certainly can’t accuse this design duo of playing it safe.. Inspired by the mass of scattered geography that covered the Earth in the days of its formation, Mary Katrantzou’s range is an exploration of creative forces and unpredictable lines. 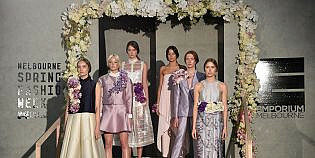 In spectacular style and true to form, Melbourne Spring Fashion Week opened and this year unlike previous incarnations the grand spectacle was brought to all Melbourne consumers, rather then the typical few that are lucky enough to usually score invites. 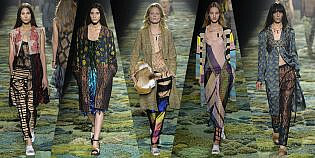 Runway 5 presented by Cosmopolitan Magazine can be described as tribute to femininity where print mix and colour blocking are still trending very strongly. Beats were laid down by a girl DJ duo which kept the show rocking to an Indie beat, a splash of electronica thrown into the mix set the tone for this colourful tour de force. Last night, on March the 17th we witnessed an opening of Virgin Australia Melbourne Fashion Festival. 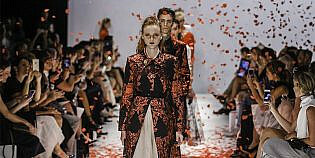 It was one of the most awe-inspiring events filled with the top Australian talent and the trendiest seasons collections. Virgin Australia’s Chief Customer Officer, Mark Hasell in his turn spoke of the company’s excitement at becoming the Festival’s Naming Rights Sponsor. 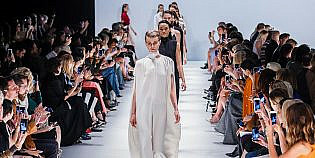 “The Melbourne Fashion Festival and Virgin Australia share core values at heart, WE share a passion for style and a deep passion to foster Australian talent,” Hassell announced. TheTrendSpotter interviews Toni Maticevski at Mercedes-Benz Fashion Week Australia 2013.